El Nido Palawan is a dream destination for both of us. Being tagged as best travel destination in the world, we were agitated to see for ourselves how wonderful the islands are. This is also the trip that changes on how we look at the world and life. May we inspire you too through our experience and captures to pack up and visit El Nido. Read on and hope this travel guide to el nido helps you on planning your best vacation! El Nido is a Philippine first class municipality in the province of Palawan and the gateway to the Bacuit archipelago. It is about 420 kilometres (260 mi) southwest of Manilaand about 238 kilometres (148 mi) northeast of Puerto Princesa, Palawan’s capital. From the abundance of pristine islands and beaches, towering limestone cliffs, enchanting lagoons to its hospitable and friendly people, El Nido is one of the top tourist destinations in Palawan, which is often referred to as the Philippines' Last Frontier. National Geographic Traveler's magazine, has chosen El Nido Palawan as one of the best travel destinations in the world. Compared to Ha Long Bay in Vietnam and Krabi in Thailand, El Nido has all the grandeur and spectacle of an island paradise without the maddening crowd and the touristy prices. From Manila airport, AirSwift has 3 daily flight schedule to Lio Airport (El Nido airport). Lio Airport is the primary and sole airport serving the town of El Nido, located about 4 kilometers from midtown. Land travel from Puerto Prinsesa is the most popular transportation going to El Nido. From Manila airport, Cebu Pacific, Philippine Airlines and Airasia have regular flights to Puerto Prinsesa. Then a 5 to 6 hours trip either by van (shuttle vans are just around the airports arrival area) or bus (ride a tricycle going to San Jose Terminal and you can find Cherry or Roro bus) going to El Nido. 2Go Travel cruises to Coron from Manila twice a week. From Coron Port, there are boats to El Nido. There are no direct sail from Manila to El Nido. El Nido have different accommodations options available for different types of travelers based on budget, needs and other preferences. There are Luxury hotels and Island Resorts, Pension houses, Affordable Lodges and Homestays. Electricity is also a factor but most hotels already have generators for this matter. 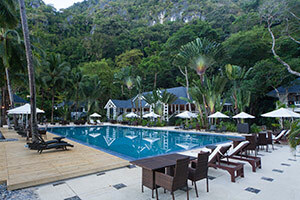 "El Nido Resorts Lagen Island"
Nestled between a lush four-hectare forest and a calm, shallow lagoon, Lagen Island Resort, is an ideal destination for those seeking a relaxing holiday in a private and tranquil island. The resort offers a magnificent view of Bacuit Bay and sunset. A small boutique hotel with 4 rooms located on Seven Commando Beach, one of the best beaches in El Nido with white, fine sand and turquoise, crystal clear waters – perfect for swimming, snorkeling, and especially, for relaxing. Provides affordable accommodations and meals both for foreign and local tourist. Guarantees guests a pleasant stay whether in Palawan for business or pleasure. From here, guests can enjoy easy access to all that the lively city has to offer. We believe that you may discover more about the place and people through their food. Where to dine and what to eat may be a least part of the trip for others, but for us it is integral. We've tried the most recommended dishes and specialties of each restaurant we've been. Tasted the crocodile sisig which taste like a pork with no fats and we can recommend this for their supplies came from a crocodile farm bred and taken care of for this purpose. We also tried the bird's nest soup which we regretted after knowing how the main ingredient is collected. The nest are usually found on dangerous cliffs and collectors risk spending months up there to guard from other collectors. Also birds takes a lot of time to make it for their eggs. We strongly do not recommend this and please do not support. We can say that fruits and seafood dishes are delightful even those serve from small eateries around the town. You can never fully experience El Nido without going Island Hopping. Tour agencies and hotel accommodations offers all tours to its guests. If you want it exclusive, they can organize a private tour or If on a budget, they can add you on a group tour. Group tours usually consists of 15 to 30 guests. The tour takes around 7 to 8 hours where the pickup time is from 8:30 AM to 9:00 AM and drop-off time is from 4:00 PM to 4:30 PM at the El Nido Town Beach. The tour includes a motorized boat transfer to the islands, Life Vest. Licensed English Speaking Tour Guide, Life Guard and Water guide. There are more of El Nido beyond the island tours. Inland tours are also offered by tour agencies in El Nido but better discovered on your own with a little help of its locals. There are taraw cliffs to climb, waterfalls to visit, and great beaches you can travel by land via a tricycle, motorcycle, bicycle. Located an hour away from El Nido via jeepney and on foot through the jungle. For adventure seekers, the trek to the waterfalls is an amazing experience far from touristy spots of the island. Located an hour away from El Nido Town, these northernmost beaches are completely undeveloped and it boasts some of the most scenic, and isolated, beaches in Palawan. Located 15 minutes away from EL Nido town via tricycle. This fine white sand beach is great for relaxing, swimming and sand bathing. You can witness and enjoy the incredibly stunning sunsets from here. El Nido at Night is very much alive. There are a lot of bars near the shore of El Nido Town beach. All kinds of music can be found here whether you like chill and relaxing, pop, country, regae or live band. Incomparable to Boracay but you'll definitely get the vibe. Located at Balinsasayaw Street Corner Rizal Street, El Nido, Palawan. Aside from being a great place to chill before the day ends, this pub was also rated to have great Food, Service and Value. Located at Sitio Lugadia Corong Corong El Nido Palawan, El Nido, Palawan. A small place with a scenic view of the beach on the day and cool sea breeze for a chill night. Located at Sitio Lugadia, Corong Corong, El Nido, Palawan, El Nido, Palawan. This pub has very welcoming staff and good food with the stunning sunset view for a nice drink by the shore. There are only 2 atm that recently opened in El Nido town but there's no assurance as it can be offline. Will always come in handy especially on the rural islands. Island Tour A is mostly recommended for first time tourists or travelers when visiting El Nido, Palawan. This tour explores mainly the different lagoons isolated by the towering lime stones. It was an enjoyable first tour for us and we were in awe with most of the destinations that we’ve been in this tour. This tour uncovers the hidden beaches and the famous shrine where the picturesque scenery that features nature at its best can be seen. This is one of the destination worth seeing. For us, this tour is a great experience even if we missed one destination. An evidence of how beautiful Palawan is, has been showcased in this tour. Tour B explores the caves and coves. Often just an option when Tour C is unavailable but for us this is a must see. Also best tour ender for us that completes our visit here. The most relaxing and refreshing tour. Since less tourists opt for this tour, it is great for those who wants a peaceful time on the islands. There are more of El Nido beyond the island tours. There are taraw cliffs to climb, waterfalls to visit, and great beaches you can travel by land via a tricycle, motorcycle, bicycle, etc. We have seen El Nido Palawan in a different way through this inland tour and that adds up to our fascination with this paradise island. Overall, El Nido Palawan exceeded our expectations. Everything is perfect considering it was our first trip. From the hospitality of its local, delicious delicacies and food, stunning sunsets, beautiful landscapes and astonishing beaches, it was the best vacation! Pin it for your future reference. Is El Nido, Palawan in your bucket list? Or Have you been to El Nido? Share your tips with fellow wanderers. Olah! Kamusta? We are Herbert and Ann, we believe that you don't need any reason why to travel, you just pack and go somewhere and create memorable memories. Let this blog be our witness!